1Preheat your oven to 400°F. 2Take your pastry dough out of the fridge and roll it out on a dry surface that has been lightly dusted with a combination of flour and sugar (too much flour could dry out your pastry) until it’s about 12” in diameter. Drape the pastry over your rolling pin and transfer it to a pie plate, and fit it inside, letting the edges hang over. 3Put the rhubarb and strawberries in a large bowl. In a smaller bowl, stir together the sugars and cornstarch; add to the fruit and toss gently to combine. Mound into the pie crust. 4To make the crumble combine the flour, brown sugar and butter in a small bowl and mix with a fork or your fingers until well combined and crumbly. 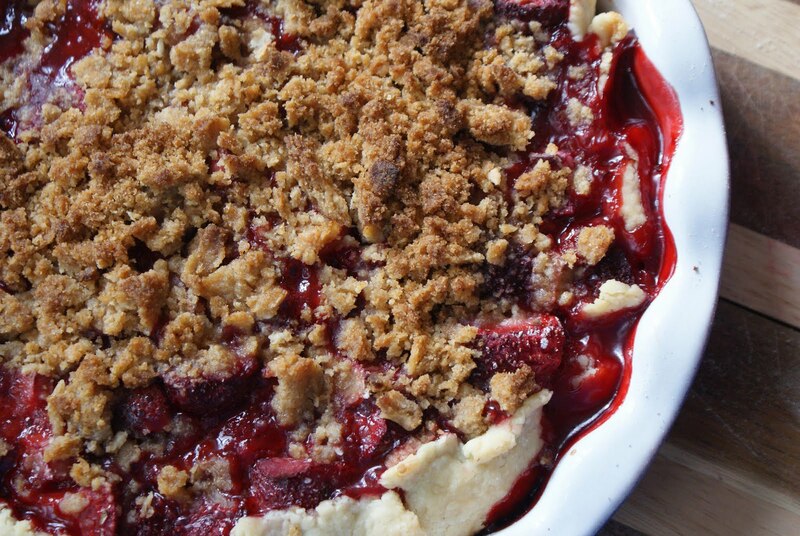 Sprinkle over the fruit, squeezing it as you go to create larger lumps of crumble. Trim and crimp the edge of the pastry, or just loosely fold it over the filling, even if there isn't much to fold. 5Bake the pie (put it on a cookie sheet or pizza pan if you are worried about drips) for 20 minutes, then reduce the oven temperature to 350°F and bake for another hour, until the pastry is golden and juices are bubbly. If the crust is browning too quickly, cover the pie loosely with foil. 6Eat warm, with vanilla ice cream.